Con l’inizio del 2015 il Freedom of Information Act inglese compie 10 anni. Ripubblichiamo qui il bilancio di luci e ombre che ne fa il ricercatore Ben Worthy (pubblicato originariamente qui). Buona lettura e buon anno a tutti! The Freedom of Information Act has enhanced the UK’s democratic system and made our public bodies more open, accountable and transparent. It has been a success and we do not wish to diminish its intended scope, or its effectiveness. These two comments sum up the difficulties of measuring how successful the UK Freedom of Information Act has been. It isn’t just about statistics on numbers of requests, users or refusals (though there are some here if you are interested). What people think also shapes how it works and how others then behave. So a former Prime Minister sees it as one of his biggest mistakes while a Parliamentary committee see it as a vital part of democracy. Which is it? What Does FOI look like? 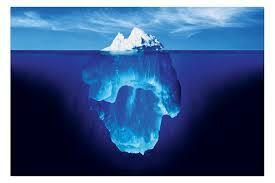 One way to think about FOI is as an iceberg (as Nicola White said in her great book). We can see only a small part of the overall process, those high level, often national FOI requests that attract controversy or attention-the MPs’ expenses scandal in 2009 was the big one that set off a chain reaction of resignations and reform. [i] There has also been FOI exposure of all sorts of subjects, from the Iraq war to health reform. In recent days, for example, we have had stories about where the Environment Agency invests its money, the number of pupils at new Free schools or the cost of green policies–see David Higgerson’s FOI Friday round-up for more. But underneath this, there are a large number of requests, probably 90 % or more, that we don’t see. Our research found most requests go to local government, somewhere between 70 to 80 % or 3.5 to 4 in every five requests (see what the Justice Committee said here). These are about local or personal issues-waste, street fixing, tax and permits- that are often ‘under the radar’. That’s not to say they can’t be spectacular-Tony Blair probably never expected his new law would lead to us knowing that 3 people were banned from Birmingham’s new library for being too smelly or to theresignation en masse of Walberswick Parish council in Suffolk. But real FOI is local, focused and probably bringing hidden benefits we don’t easily see. A key problem underlining all FOI analysis is the lack of knowledge about requesters and their motivations. The table below is based on estimates of requester types to central and local government from FOI officers. Contrary to the views of Tony Blair, FOI requesters are not just journalists. The largest group across central and local government appears to be members of the public. We felt that the public consists of a small group of politically engaged with a larger group pursuing issues of “micro-politics” or of private importance. There is a clear rise and fall of public interest with the news agenda-snow leads to requests about snow plows, spying about government snooping levels. However, many requests were focused, “quite niche” or on “specialised” issues- a planning dispute or parking fine at local level or access to benefits at central government (or even who was paid what to switch on the town Christmas lights). Requesters’ motivations were also diverse. Even the small sample of requesters we found and spoke to in our studies gave a huge variety of reasons for using FOI, from “concern about wasted money” to “curiosity”, “general interest” and personal campaigns against “corrupt” local government. So, the sheer variability of requester motivations and use underscores the variability of impact of the Act upon different public bodies. FOI has been subject to clear ‘battle’ over how the Act is working, with a public divide between sceptical (mainly) senior politicians and officials and supporters of the Act in the media, NGOs and the appeal system. The extent to which FOI is supported varies across departments and local government bodies, dependent on the individual leadership, culture and environment of different public bodies. On the whole, government officials support the Act and work with it. While welcoming it as an idea, senior politicians have been less keen on the loss of control or unexpected issues or scandals sprung on them. As well as claiming it is vaguely ‘abused’, a number of senior officials and politicians have argued that FOI negatively affects decision-making processes, though we found there was no real evidence for this (which didn’t stop some rather interesting anecdotes to the Select Committee). While Tony Blair was clear in his views that FOI was an all-round disaster, David Cameron’s more subtle approach has been to argue that ‘real freedom of Information’ was about ‘spending’ while other requests ‘furred up the arteries’ of government-a comment that revealed a very particular view of what information rights ‘should’ be used for. Numerous politicians have also highlighted the ‘cost’ of FOI, though, like many economic arguments, this is actually smokescreen for a political debate. And when different studies have concluded that requests costs either £200, £36 or £19 each, the discussion becomes a little confusing (see this post here and a longer report here). The danger is that all this combined negativity may encourage poor behaviour and lead to a small ‘anti- FOI’ group at the very top of government. While, for example, Blair’s claim that FOI is used only by journalists is demonstrably untrue, it adds to a distorted view of FOI. On the other side of the divide, FOI has a clear constituency of supporters in the media, Parliament and across various NGOs as well as in the courts and the appeal system. Supported by high profile cases such as MPs’ expenses, the symbolic importance of FOI legislation offers the reform a robust protection, backed up by a powerful and vocal constituency. Supporters of the Act have constantly innovated, pushed key cases and also sought to persuade successive governments to extend the Act private bodies working on behalf of public authorities. Since 2005, but gathering pace since Tony Blair’s comments in 2010, there remains a continuous ‘fighting on the borders’ over where the Act begins and ends and whether it is ‘good’ or ‘bad’. In 2009, supporters scored some success by persuading Gordon Brown to shorten the period of disclosure of historical records from 30 to 20 years. David Cameron’s Transparency Agenda has undoubtedly helped push further openness, as have events like the Hillsborough inquiry. FOI appears to be a success and is (probably) here to stay. This is not just about numbers- it is supported, used and co-operated with by most officials. It can, and does, bring very public benefits and may also be locally bringing positive outcomes we don’t see. It has not only led to new issues on the agenda (not least the UK’s role both in extraordinary rendition and covering it up) but also helped in the creation of a new watchdog to regulate MPs’ expenses and a change in the law over the tax status of members of the House of Lords. It has also kicked off developments like mySociety’s WhatDoTheyKnow and has popped up in all sorts of interesting areas, such as the app that lets you know if politicians are editing Wikipedia pages. Worthy, Ben and Hazell, Robert, The Impact of the Freedom of Information Act in the UK (August 26, 2013). Nigel Bowles, James T Hamilton, David Levy (eds) Transparency in Politics and the Media: Accountability and Open Government, London: L.B. Tauris, 31-45, 2013. Available at SSRN: http://ssrn.com/abstract=2487541 and work by the Constitution Unit here. [i] I’m obliged to point out the scandal was a combination of an FOI request by Heather Brooke, four years of appeals, a court case and (finally) a good old fashioned paid for leak. [ii] I shamelessly borrowed this from Orwell’s definition of liberty ‘If liberty means anything at all it means the right to tell people what they do not want to hear’ (from his unpublished preface to Animal Farm) and tried to rework this to fit transparency: ‘Transparency is the right to ask questions those in power don’t want asked and look for information they don’t want us to see’ see this post.